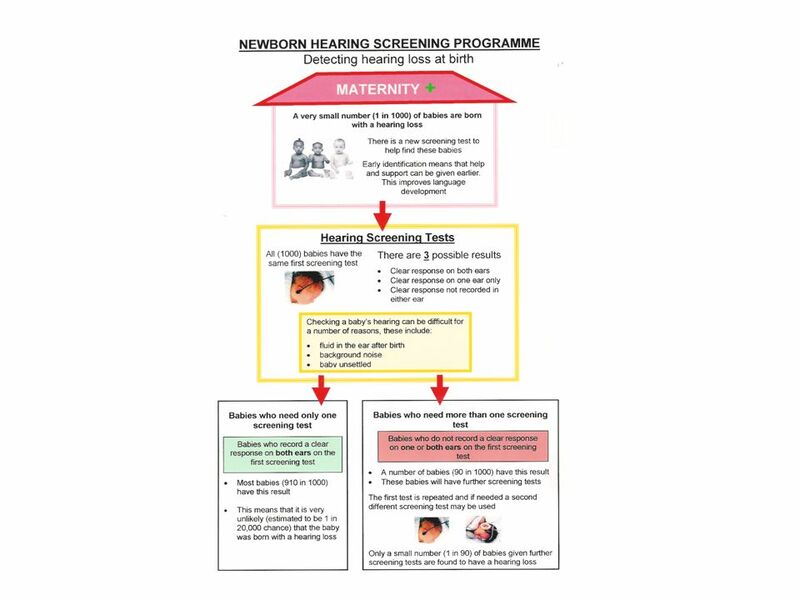 2 Newborn Hearing Screening Programme Evaluation. 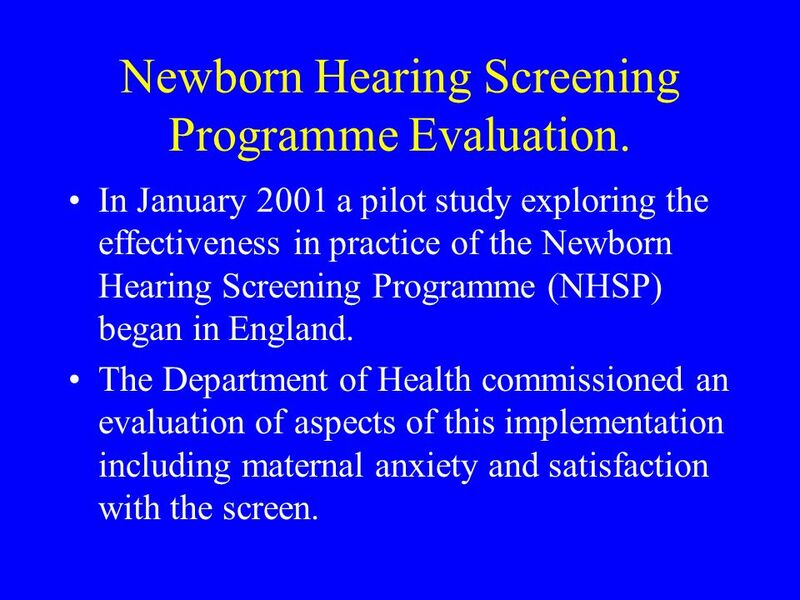 In January 2001 a pilot study exploring the effectiveness in practice of the Newborn Hearing Screening Programme (NHSP) began in England. 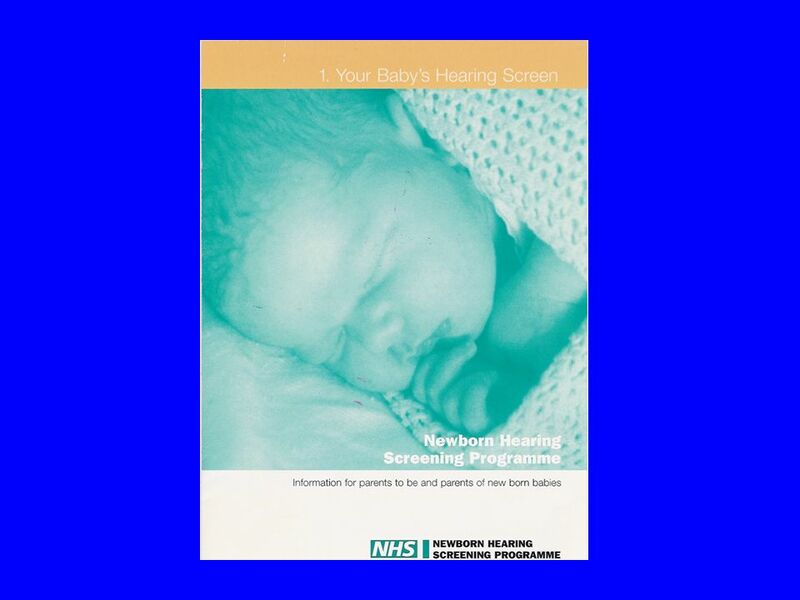 The Department of Health commissioned an evaluation of aspects of this implementation including maternal anxiety and satisfaction with the screen. 3 Research Aims I. 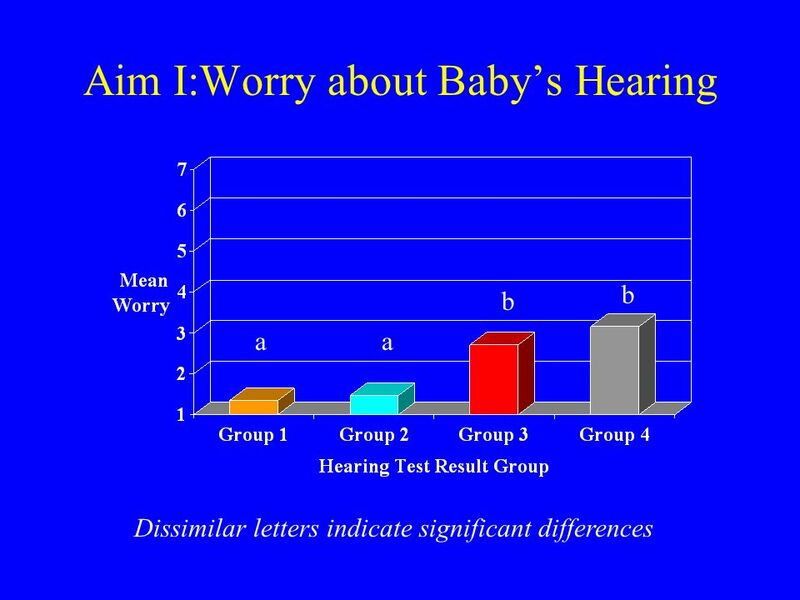 To describe and compare anxiety, worry and satisfaction in mothers of babies undergoing newborn hearing screening and receiving different results. II. 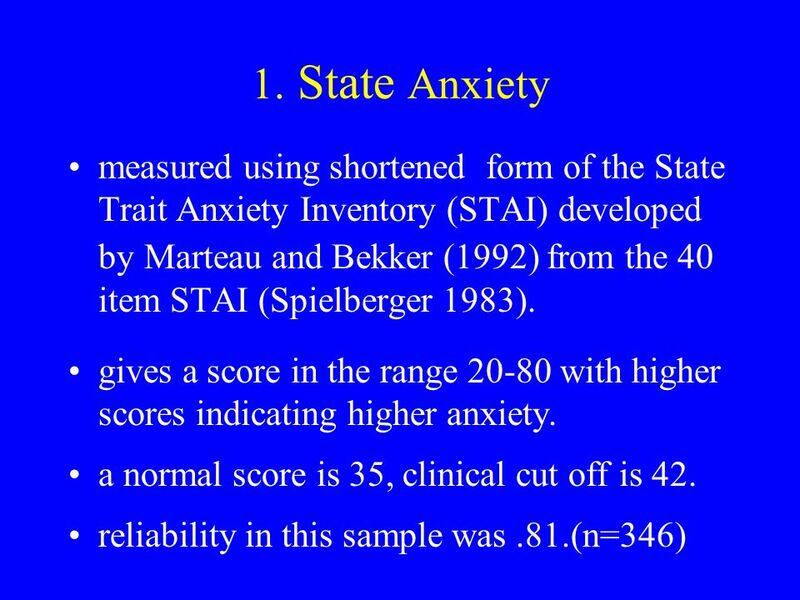 To examine the possible protective effect of knowledge in preventing worry. 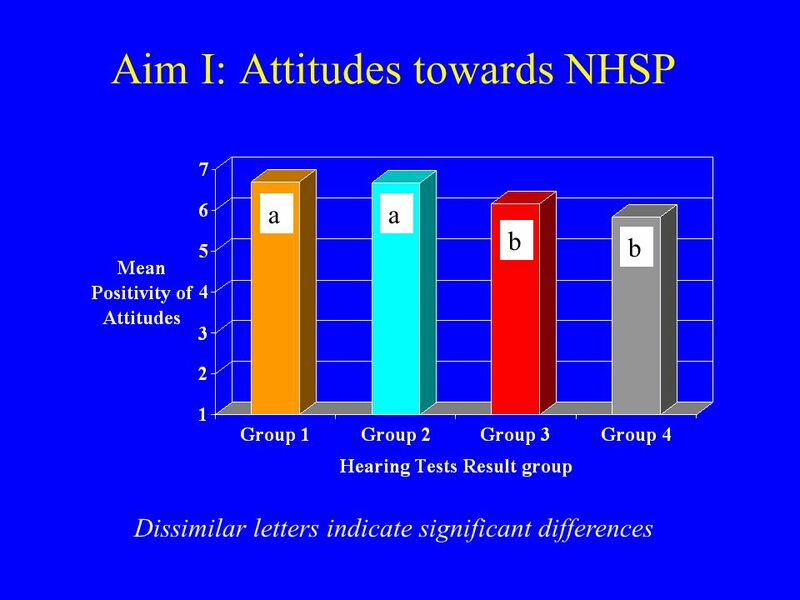 6 Comparison Groups Group 1 - clear response in both ears on OAE test. 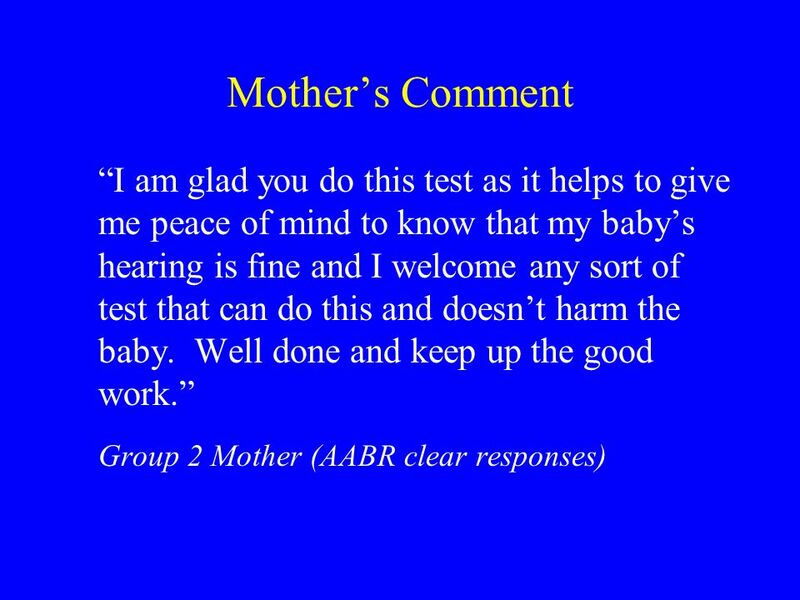 Group 2 - clear response in both ears on AABR test. 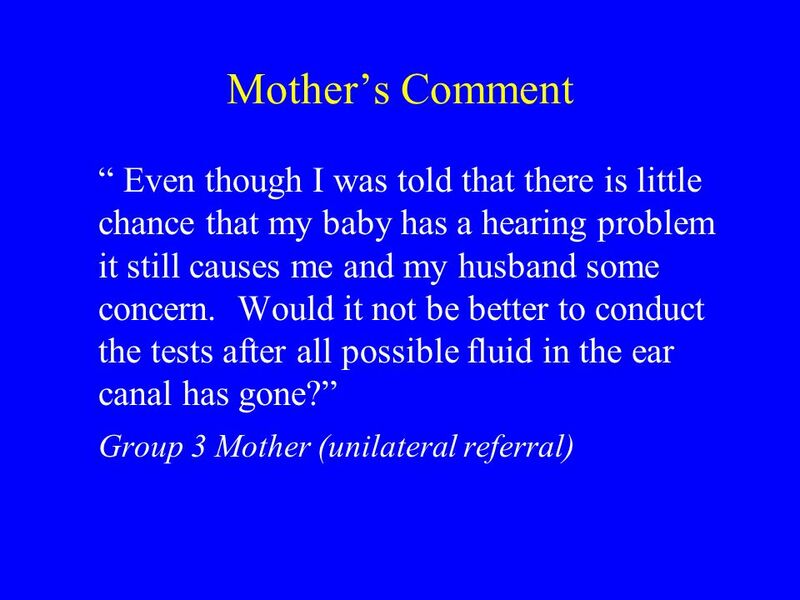 Group 3 - no clear response in one ear on AABR, unilateral referral. 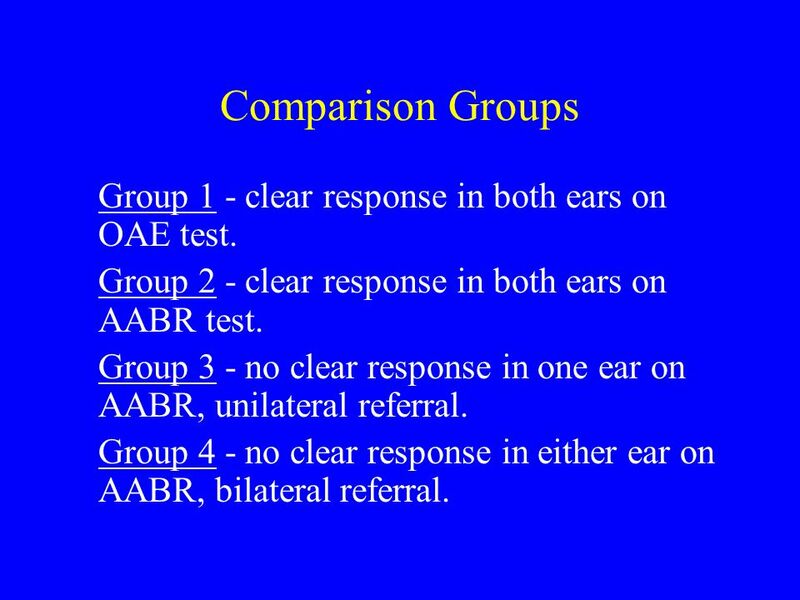 Group 4 - no clear response in either ear on AABR, bilateral referral. 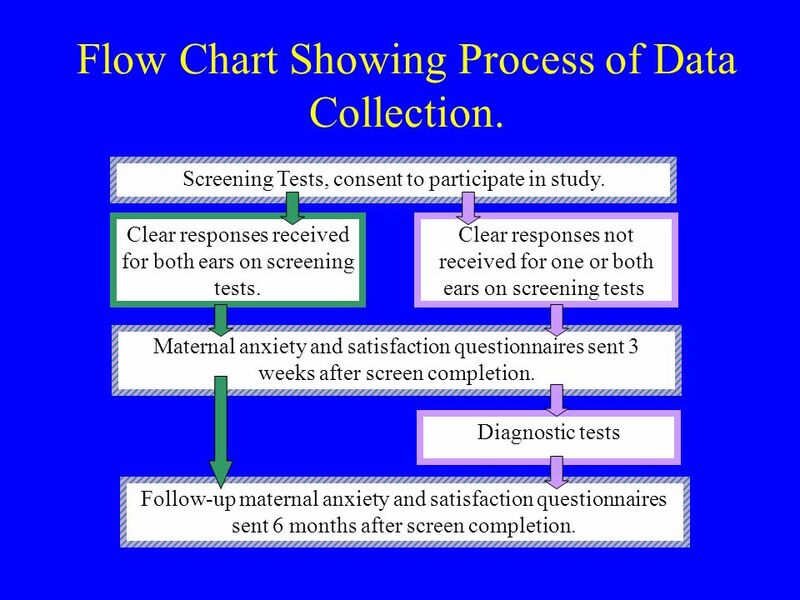 7 Flow Chart Showing Process of Data Collection. 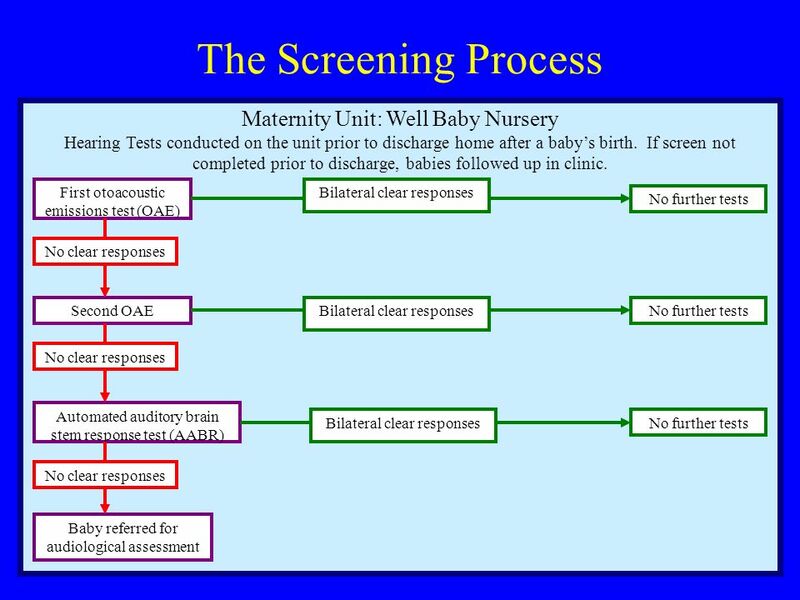 Screening Tests, consent to participate in study. 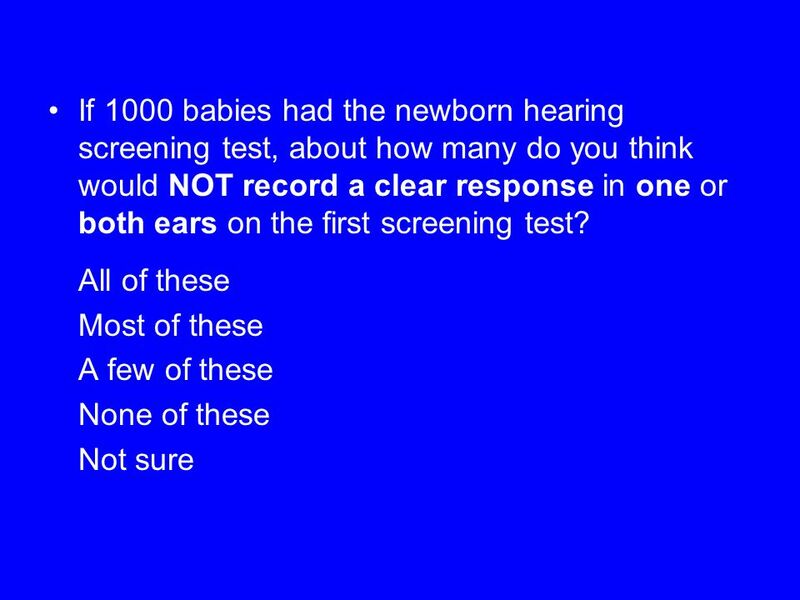 Clear responses not received for one or both ears on screening tests. 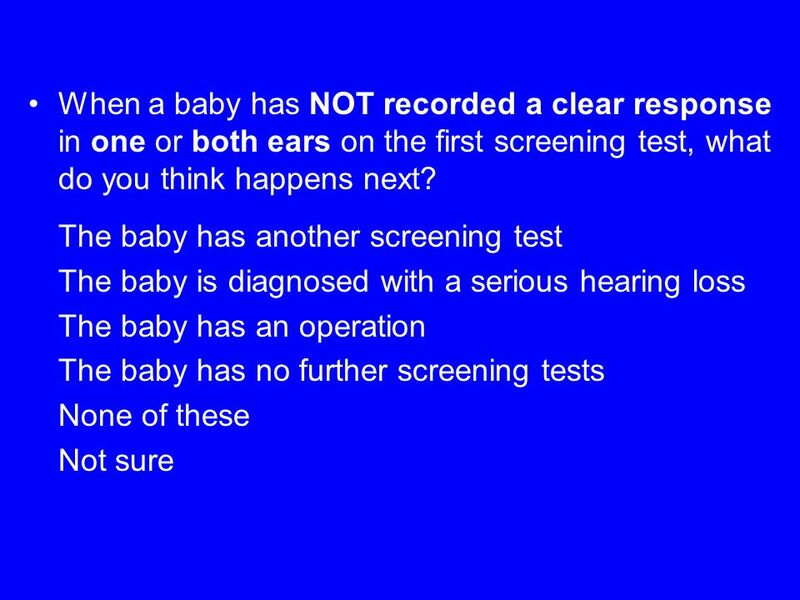 Clear responses received for both ears on screening tests. 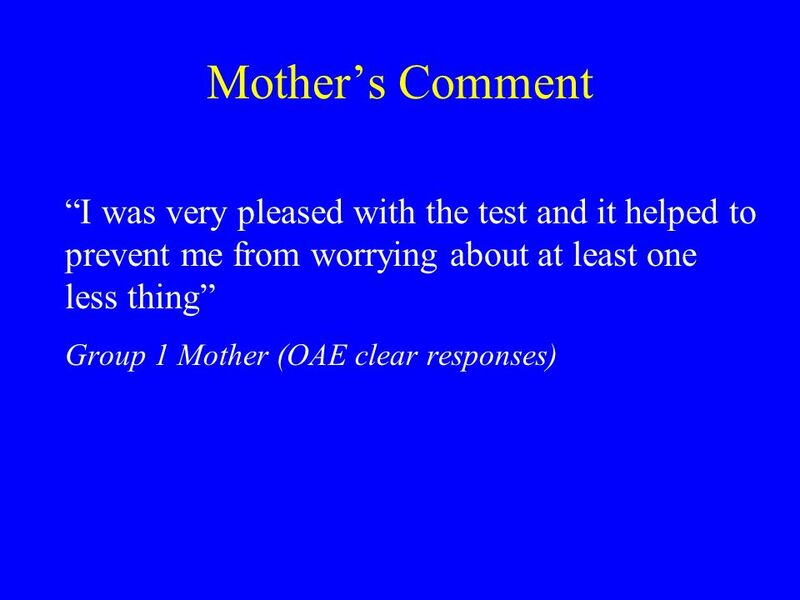 Maternal anxiety and satisfaction questionnaires sent 3 weeks after screen completion. 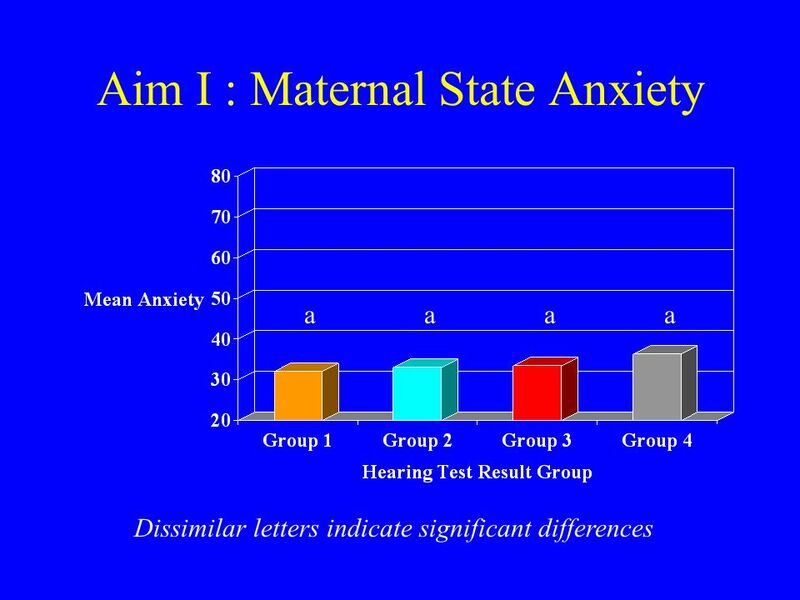 Diagnostic tests Follow-up maternal anxiety and satisfaction questionnaires sent 6 months after screen completion. 11 2 & 3. 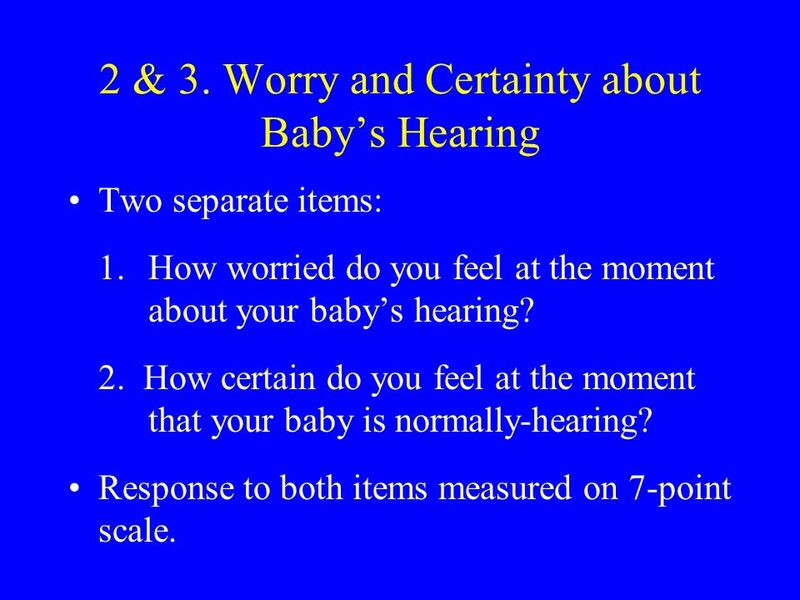 Worry and Certainty about Babys Hearing Two separate items: 1.How worried do you feel at the moment about your babys hearing? 2. 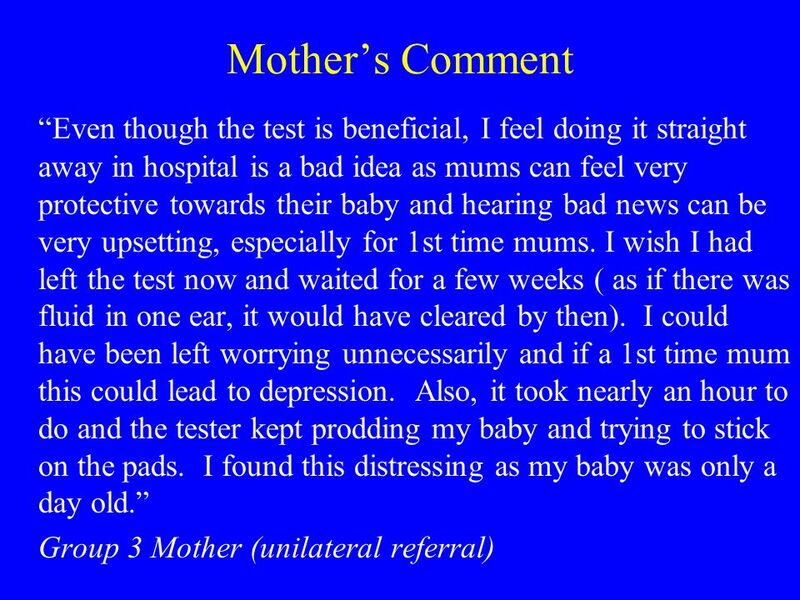 How certain do you feel at the moment that your baby is normally-hearing? Response to both items measured on 7-point scale. 14 6. 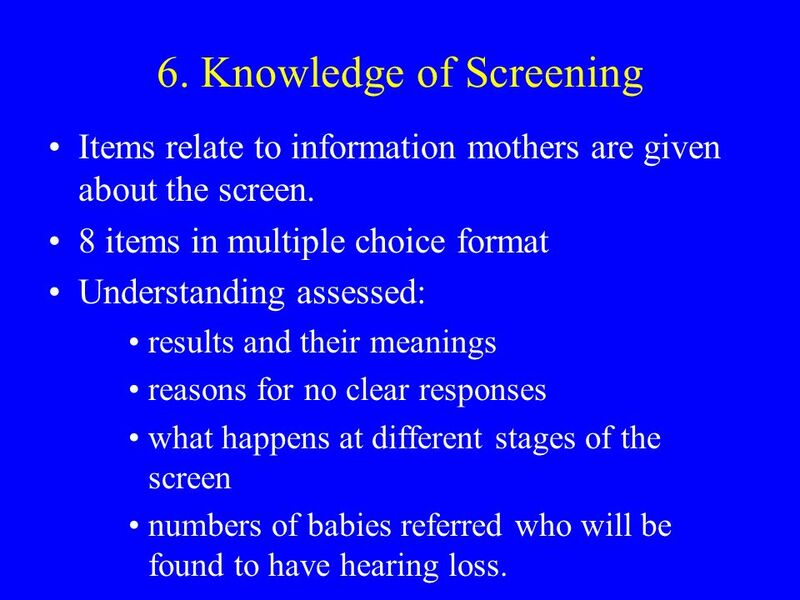 Knowledge of Screening Items relate to information mothers are given about the screen. 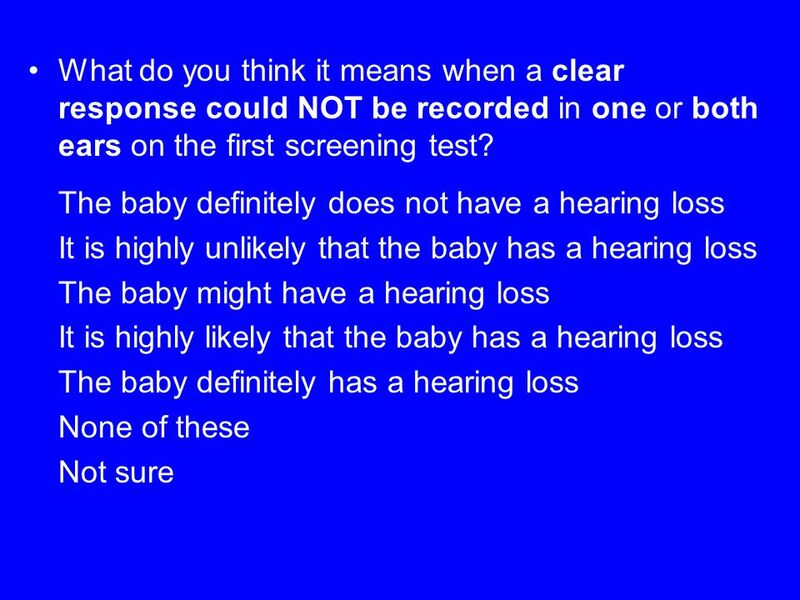 8 items in multiple choice format Understanding assessed: results and their meanings reasons for no clear responses what happens at different stages of the screen numbers of babies referred who will be found to have hearing loss. 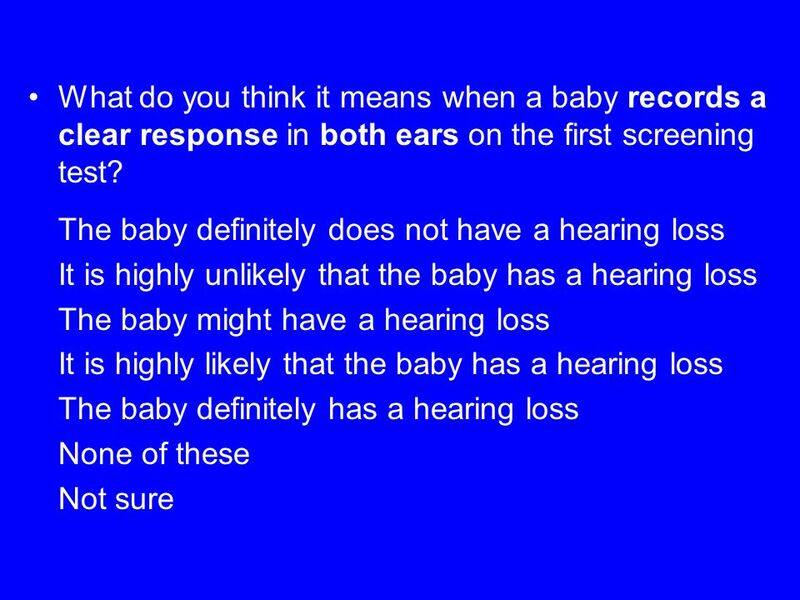 20 Why do you think a baby might NOT record a clear response? 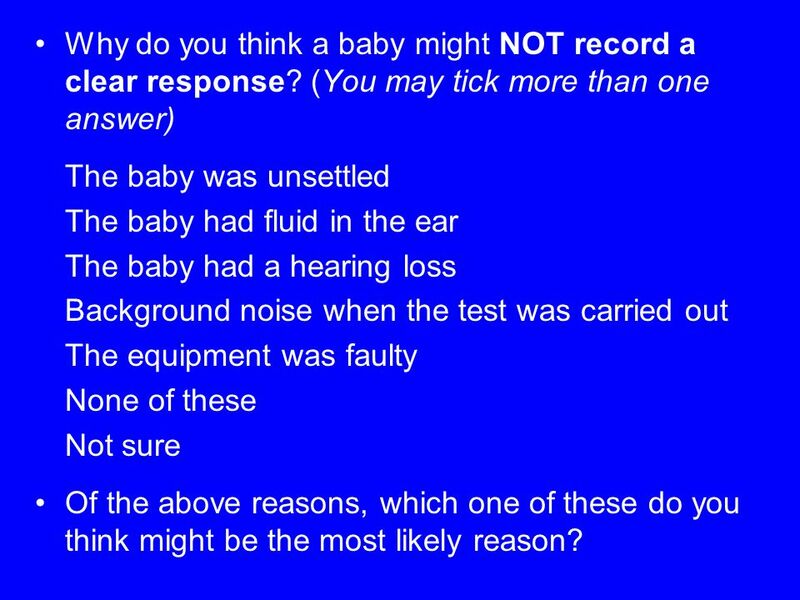 (You may tick more than one answer) The baby was unsettled The baby had fluid in the ear The baby had a hearing loss Background noise when the test was carried out The equipment was faulty None of these Not sure Of the above reasons, which one of these do you think might be the most likely reason? 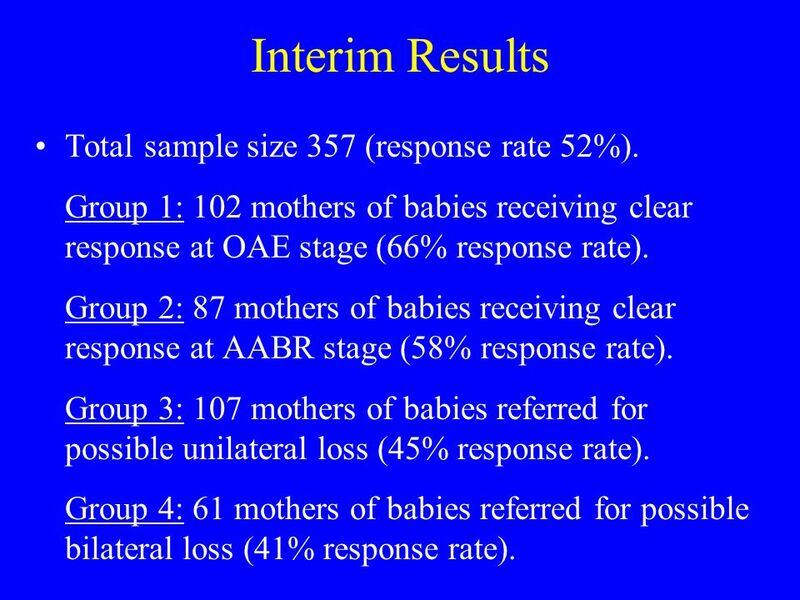 23 Interim Results Total sample size 357 (response rate 52%). 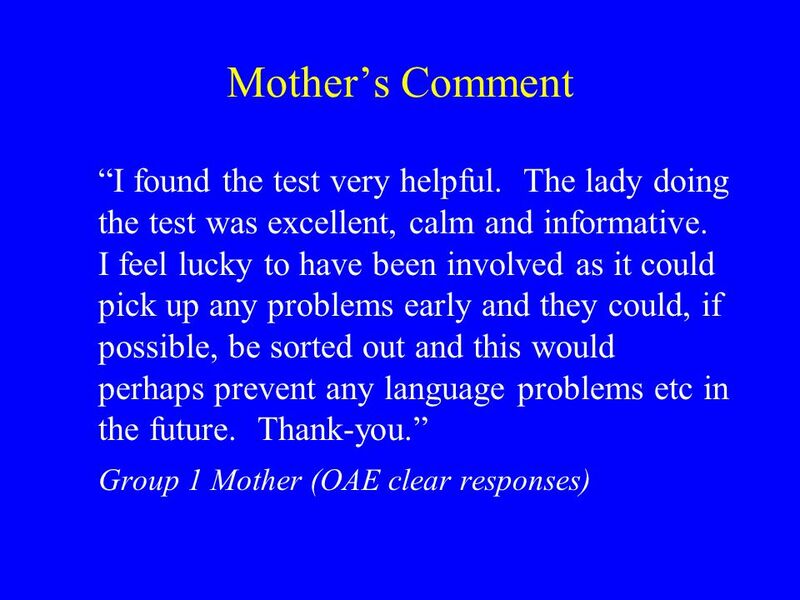 Group 1: 102 mothers of babies receiving clear response at OAE stage (66% response rate). 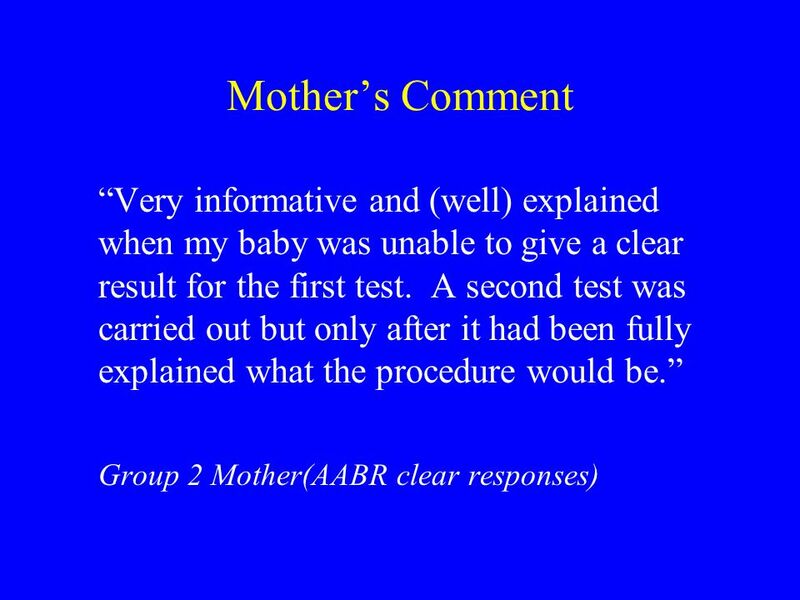 Group 2: 87 mothers of babies receiving clear response at AABR stage (58% response rate). 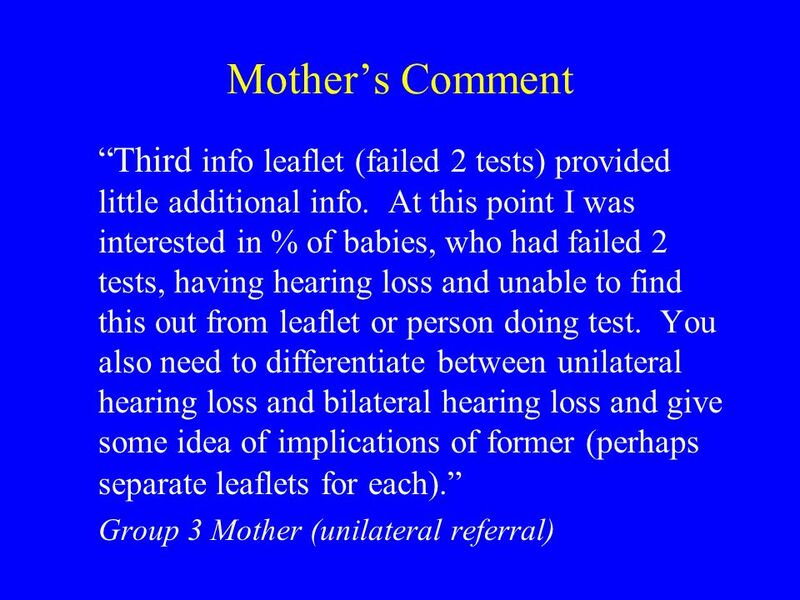 Group 3: 107 mothers of babies referred for possible unilateral loss (45% response rate). 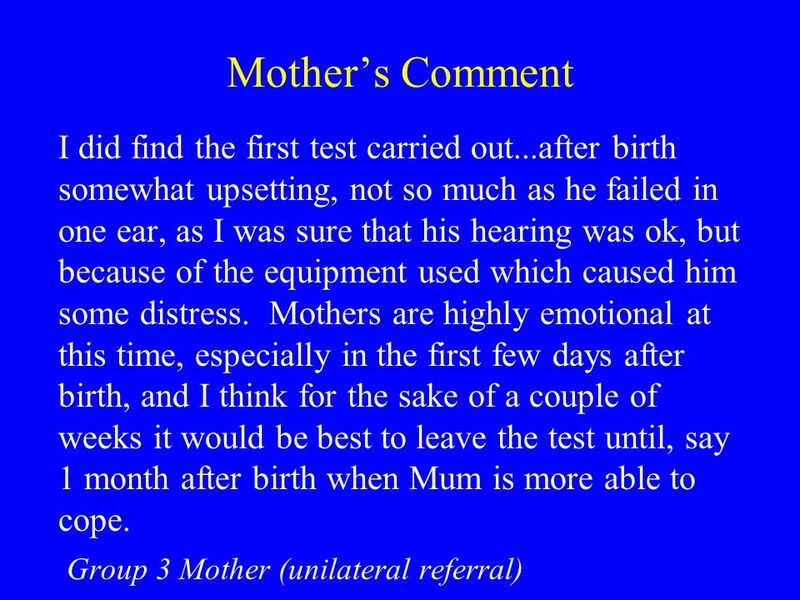 Group 4: 61 mothers of babies referred for possible bilateral loss (41% response rate). 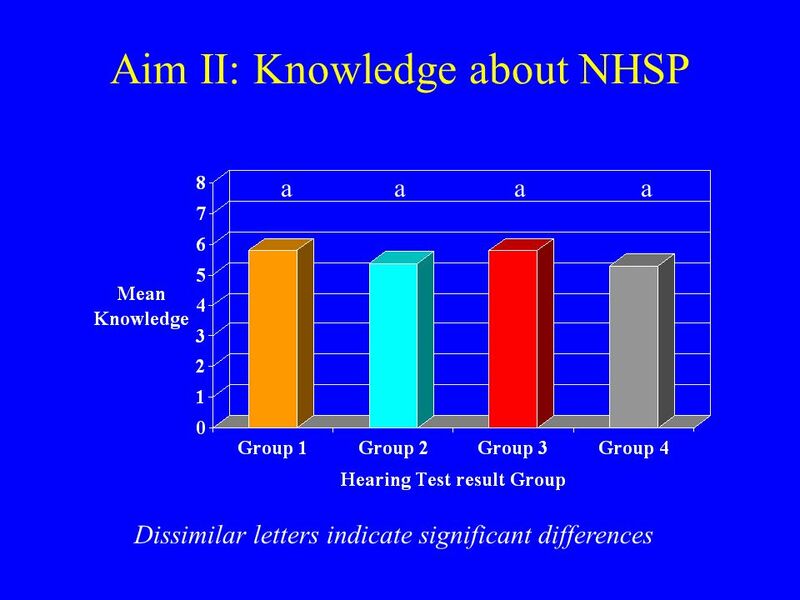 43 Aim II: Correlates of Knowledge about NHSP * correlation significant at 0.05 level, ** correlation significant at 0.01 level. 44 Knowledge, Worry and Certainty. 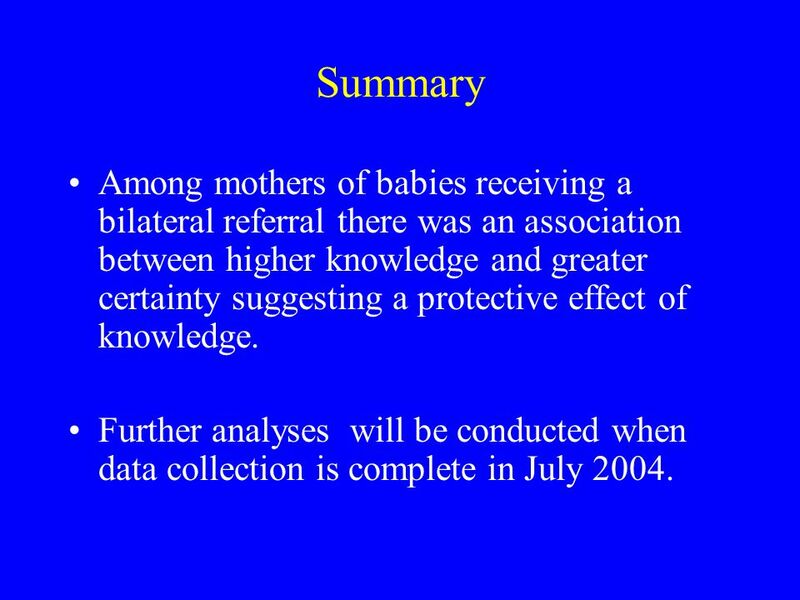 Aim:to explore relationship of knowledge about NHSP and worry and certainty about babys hearing. 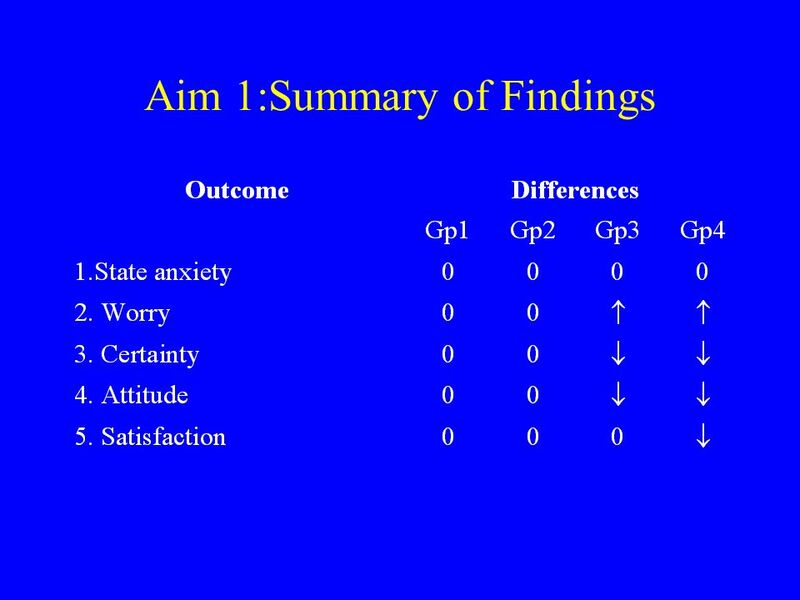 Levels of certainty and worry compared between those who got each knowledge item right and those who got each answer wrong. 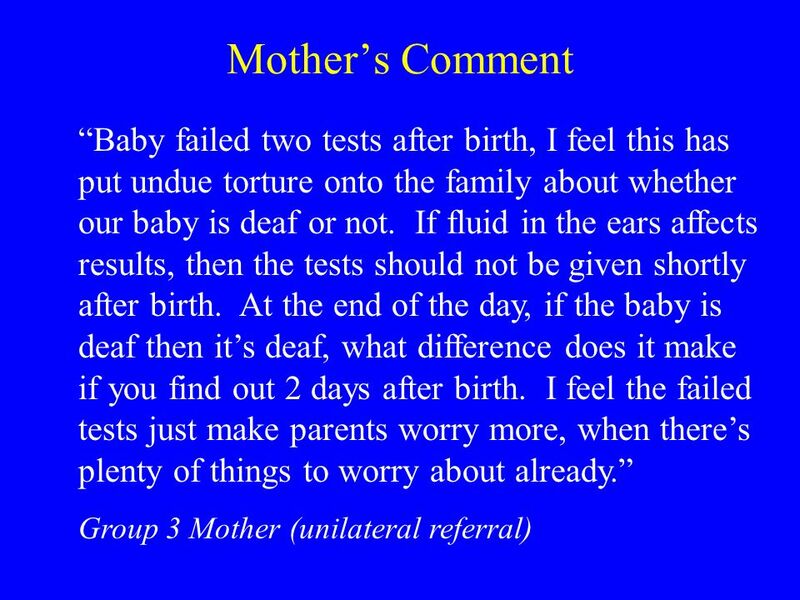 Test conducted separately for mothers of babies referred unilaterally and those referred bilaterally. 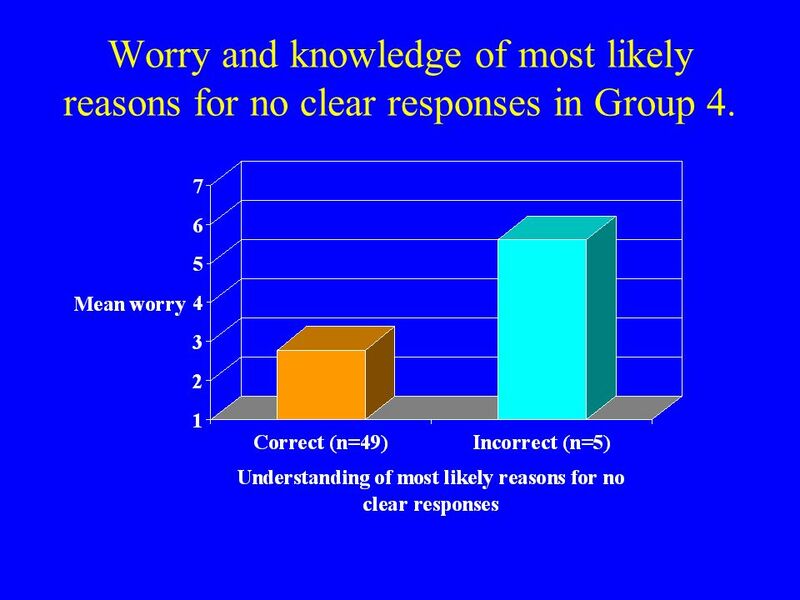 46 Worry and knowledge of most likely reasons for no clear responses in Group 4. 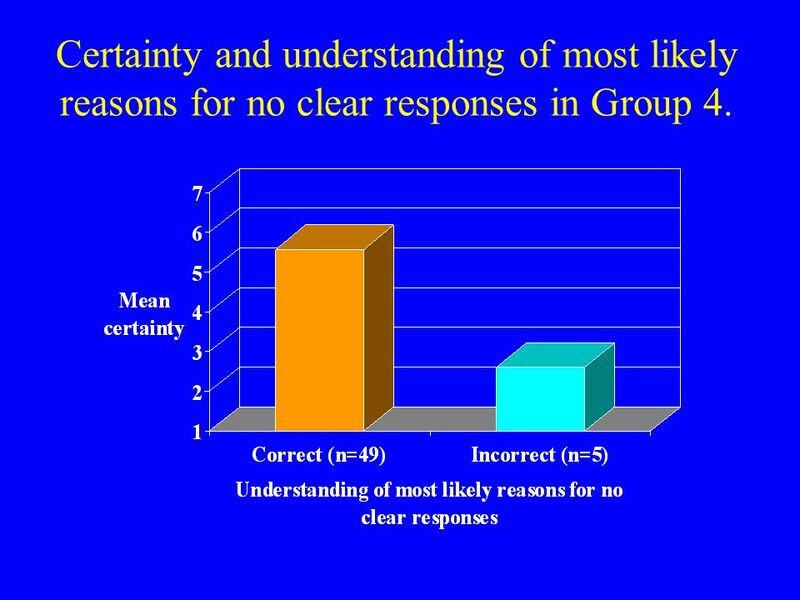 47 Certainty and understanding of most likely reasons for no clear responses in Group 4. 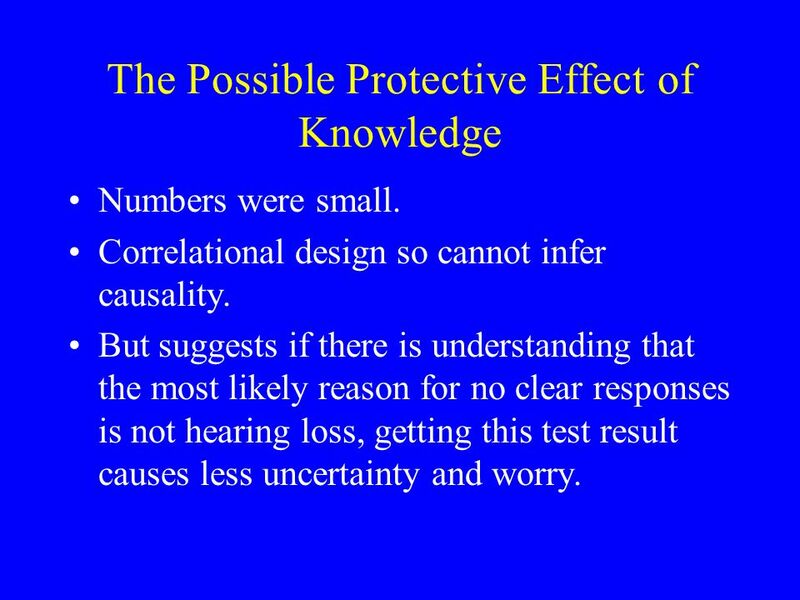 48 The Possible Protective Effect of Knowledge Numbers were small. Correlational design so cannot infer causality. 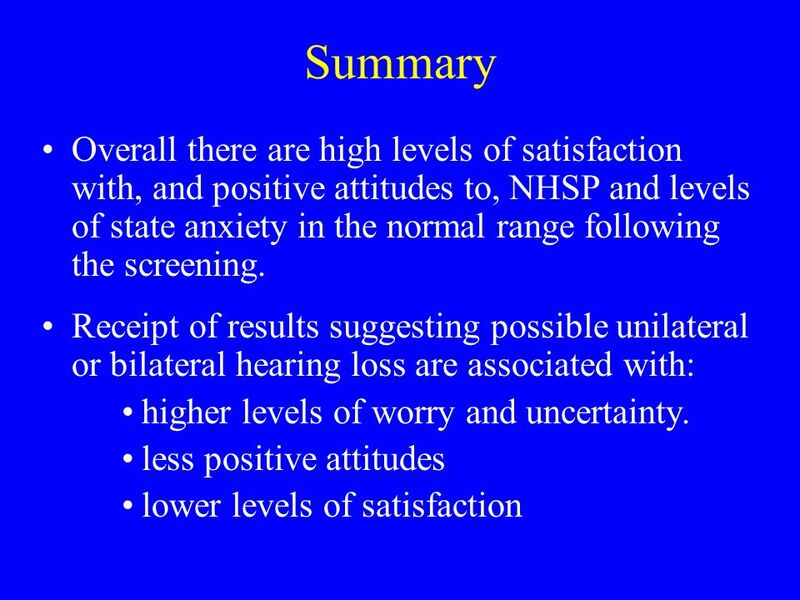 But suggests if there is understanding that the most likely reason for no clear responses is not hearing loss, getting this test result causes less uncertainty and worry. 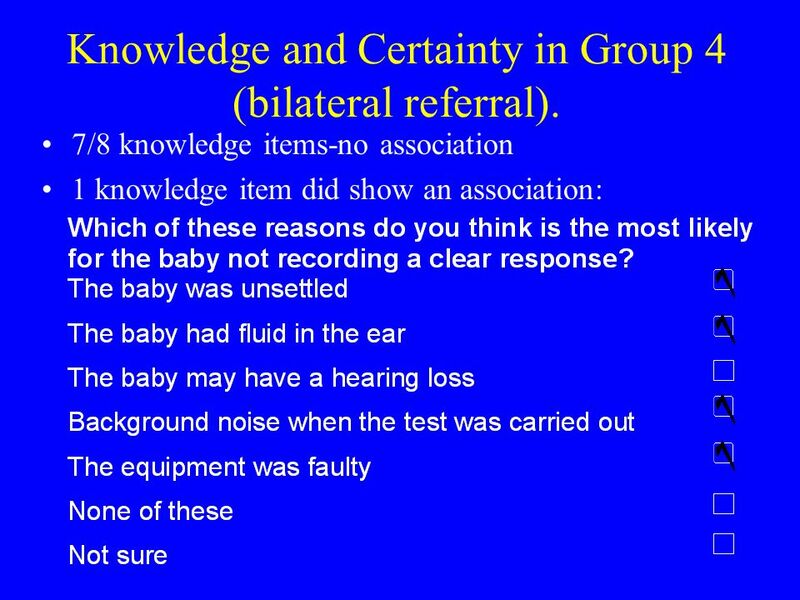 50 Summary Among mothers of babies receiving a bilateral referral there was an association between higher knowledge and greater certainty suggesting a protective effect of knowledge. Further analyses will be conducted when data collection is complete in July 2004. 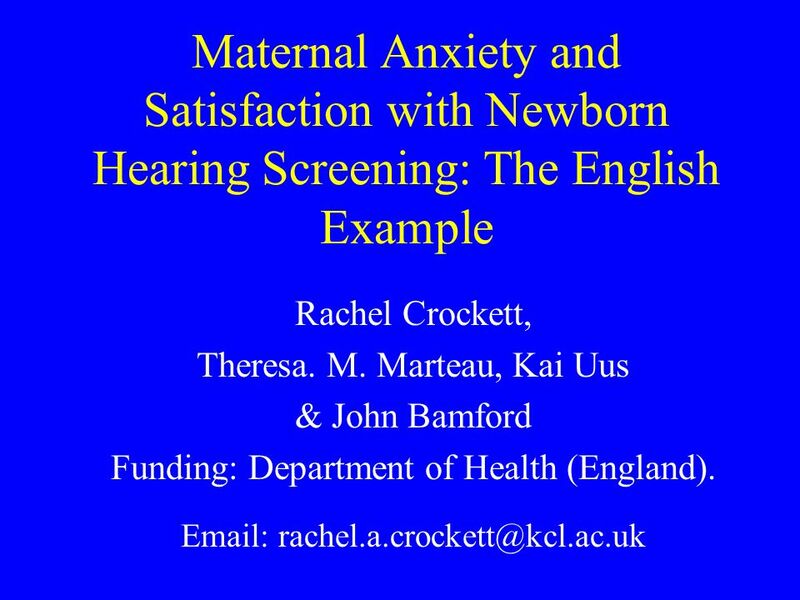 Download ppt "Maternal Anxiety and Satisfaction with Newborn Hearing Screening: The English Example Rachel Crockett, Theresa. 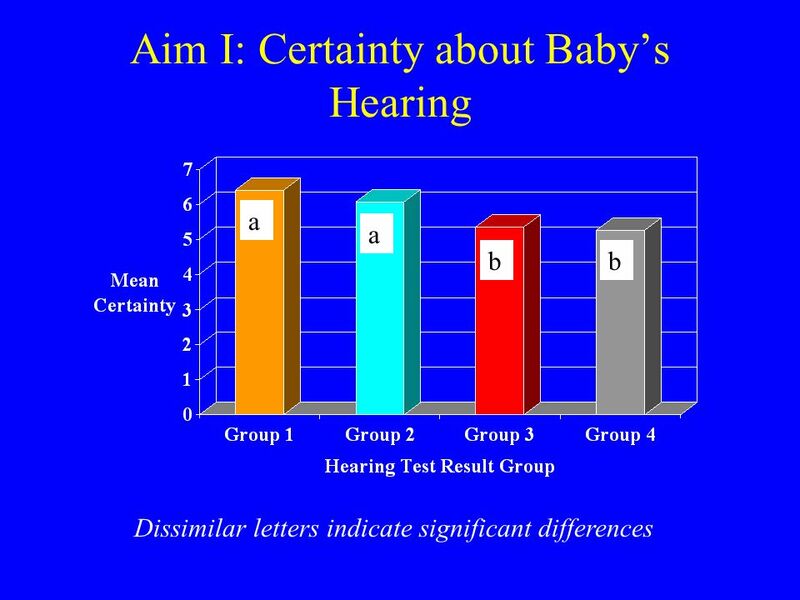 M. Marteau, Kai Uus & John Bamford Funding:"
Evaluation of a of a Statewide Early Hearing Detection and Intervention Program Karen M. Ditty, M.S.,CCC-A National Center for Hearing Assessment and Management. 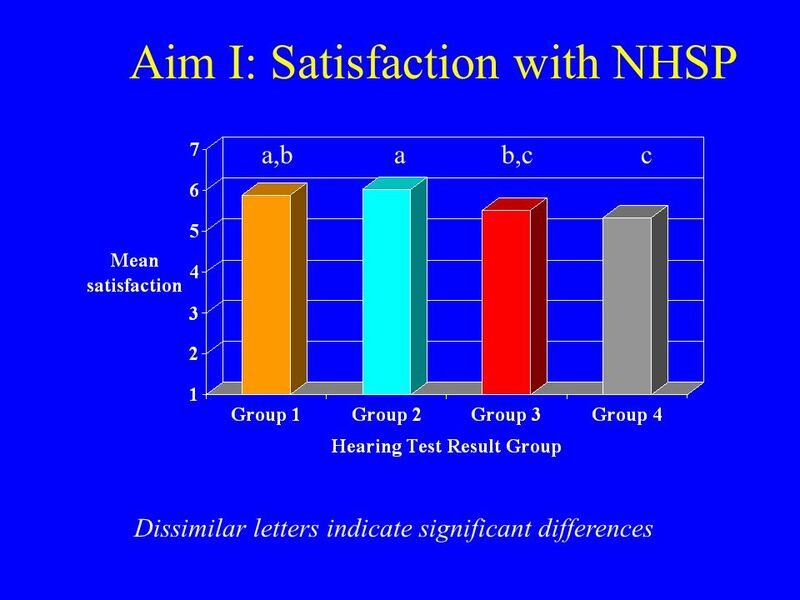 Evaluation Utahs Early Hearing Detection and Intervention Program of Karl R. White, PhD National Center for Hearing Assessment and Management Utah State. Delivering Screening Results: What Parents Want Janet DesGeorges Colorado Families for Hands & Voices Cami Geilenfeldt Iowa Hands & Voices. 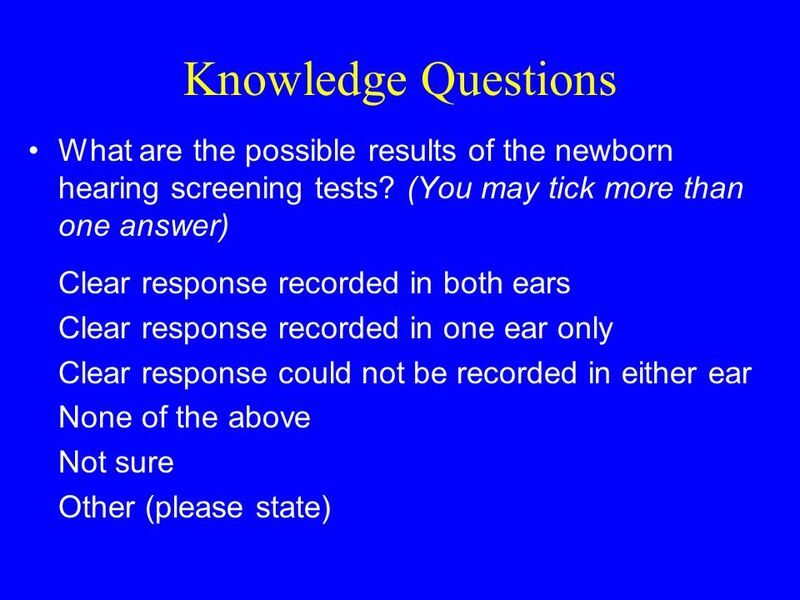 Characteristics of Congenital Hearing Loss Barbara S. Herrmann, Ph.D. CCC-A Audiology Department Massachusetts Eye and Ear Infirmary Harvard Medical School. 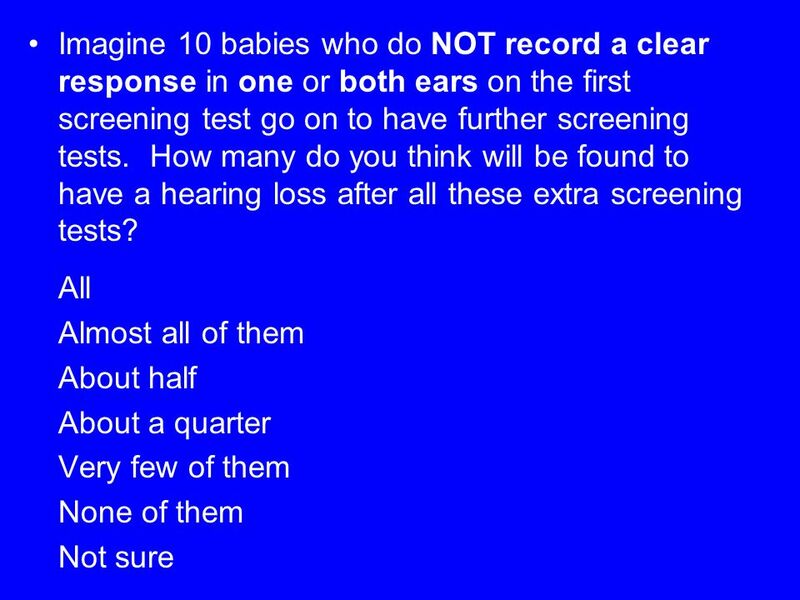 Missouri Newborn Hearing Screening Program: A Report on the First Two Years Missouri Department of Health and Senior Services. 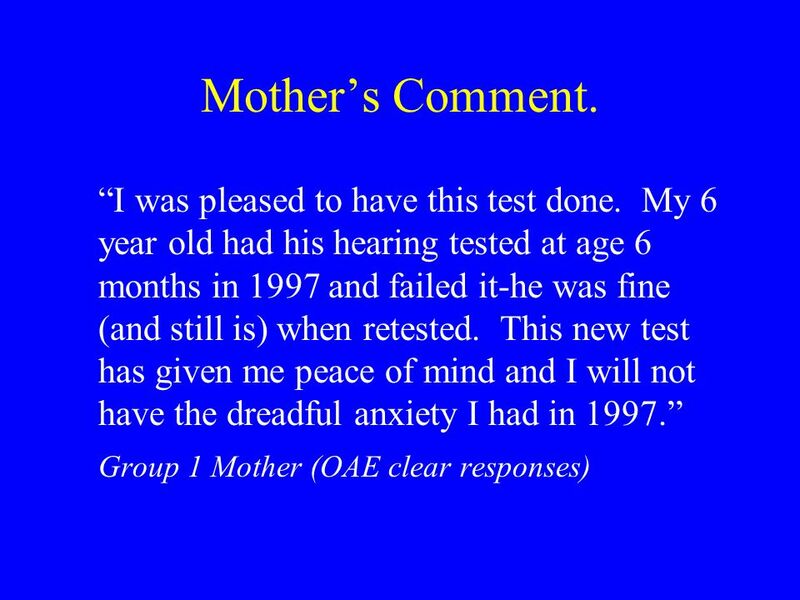 What Early Diagnosis and Intervention has meant to one family. Eligibility Review Consultation Multi-provider Forum 04 November 2010 Multi sector provider forum 4th Nov.
NIGB NATIONAL INFORMATION GOVERNANCE BOARD FOR HEALTH AND SOCIAL CARE Sams Story Information Sharing module. 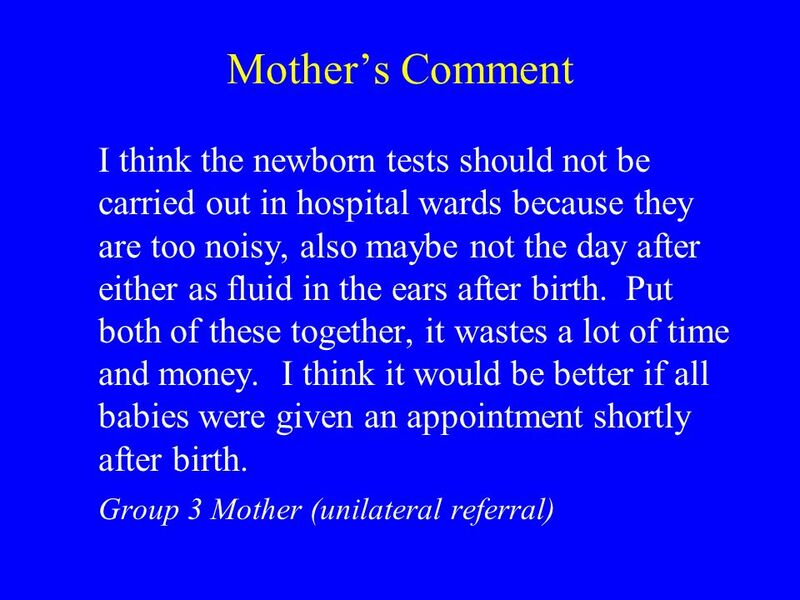 Midwifery Postgraduate Seminar How pregnant women in Hong Kong Perceive labour pain Irene Lee 24 November 2011. My research By Ella-Rose Smith. The Attitudes of Elderly Patients and their Relatives to being Boarded from Acute Medical Assessment at the Edinburgh Royal Infirmary. Amy Begg Staff. 1 National Outcomes and Casemix Collection Training Workshop Strengths and Difficulties Questionnaire. Kinship Care – Client Complexity Preliminary Research Findings ACWA Presenters: Marita Scott & Lynne McCrae. Children’s subjective well-being Findings from national surveys in England International Society for Child Indicators Conference, 27 th July 2011. Surveys and Questionnaires. How Many People Should I Ask? Ask a lot of people many short questions: Yes/No Likert Scale Ask a smaller number.